Payroll Tax Updates are an important part of year-end processing. 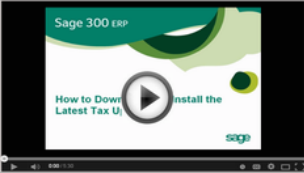 Here are the steps to download and install your Sage 300 ERP tax updates. Login to the Sage Customer Portal and visit Sage 300 ERP Downloads to access the latest updates. Run the executable file that you just downloaded. roll in Sage 300 ERP (Accpac) version 5.6 and later. You must have a user name and password along with a current Business Care support plan to access and download tax updates from the Sage Customer Portal. For related posts, check out our Tips for a Successful Year End and a Year End Payroll Processing checklist. If you require additional assistance, please Contact us with your specific questions.